The Dead Weather es el nuevo proyecto del prolífico Jack White; un supergupo formado por Alisson Mosshart(The Kills)en la voz, Dean Fertita ( Queens Of The Stone Age) a la guitarra, Jack Laurence ( The Raconteurs ) al bajo, y el propio White en la bateria. 150 afortunados tuvieronn la ocasión de verlos ayer en directo en la fiesta de inaguración de las nuevas oficinas del sello Third Mand Records en Nashville. " Hang you from the Heavens" es el single de presentación, al que acompaña como cara b una versión del "Are Friends Electric" de Gary Numan. 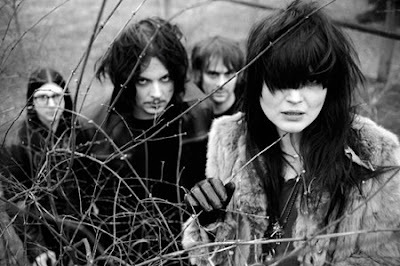 The Dead Weather is the new Jack White's proyect, a supergroup with Alisson Mosshrat(The Kills) on vocals, Dean Fertita (Queens Of The Stone Age ) on guitar, Jack Laurence (The Raconteurs) on bass, and White on drums and vocals too. 150 lucky people got the chance to saw them live yesterday, as a surprise for the opening party of Third Man's Records new office in Nashville. "Hanging You From The Heavens" is their debut single, which features a version of Gary Numan's "Are Friends Electric on the B side". Listen to Telekinesis debut in full ! !